The celebration of your marriage is as important to us as it is to you. You have chosen to begin your married life in the Catholic Church. Such a step is significant - you have recognized that your marriage must be centered in Jesus Christ and the Community of the Church. As your parish family, we are here to walk with you on this journey, as you celebrate your wedding day and throughout your married life. To assist you, we have prepared this booklet which contains background information and guidelines to help insure the joyful, reverent and prayerful celebration of the Sacrament of Marriage. It is meant to help you prepare not only for your wedding day, but also for your marriage – a lifetime of faith, hope and joy. There are many questions a couple may have regarding their marriage. These should be addressed with the priest during the first appointment. Because circumstances vary, this booklet cannot cover them all. The priest will discuss with each couple the steps they need to take. Marriage is a Sacrament. It is a public sign where the couple vows mutual and lasting fidelity in the presence of the Church. In this Sacrament, our Lord pledges to be with the couple providing strength to live out their commitment. The couple's promise, made in the Church, provides the assurance of a faith community to deepen their relationship and provide structure to live the faith and pass it on to another generation. ​The couple is the minister of the Sacrament. While they are the focus of the day, the celebration of a Sacrament makes the marriage more than just "their day." The nature of the Sacrament demands that the marriage be celebrated in certain ways. ​Catholic marriages ordinarily take place in a Catholic Church and usually in the church of the bride or groom and/or their parents. To receive the Sacrament of Marriage, at least one of the parties seeking to marry must be Roman Catholic. Registration at St. Francis of Assisi or another Roman Catholic parish is preferred. ​When a couple calls the parish office to set up a date and time, the parish secretary will check the availability of that date and time. She will then give your name to one of the priests who will call to set up an appointment. Weddings will not be scheduled for Palm Sunday, Easter or Family Event weekends. NO DATE FOR THE WEDDING AND/OR REHEARSAL CAN BE CONSIDERED FINAL UNTIL THE COUPLE HAS MET WITH ONE OF THE PARISH PRIESTS OF ST. FRANCIS. Weddings are usually scheduled for Friday afternoon, or at 2:00 p.m. on Saturdays. An hour and a half is allotted for the wedding. At the time of scheduling, a rehearsal time is also scheduled, ordinarily at 6:00 p.m. the evening before the wedding. ​A Declaration of Nullity must be provided at the time of your booking in order to demonstrate that you are now free to marry in the Catholic Church. This applies to all forms of previous marriage, whether by a judge, by a religious leader in another faith tradition, or common law. If you have any questions, please speak with a parish priest. ​The Sacrament of Reconciliation (Confession) is strongly encouraged for the Catholic members of the wedding party at least one week prior to the wedding. Not included in this amount is a $20.00 suggested gift for each Altar Server. Two Altar Servers are scheduled for each wedding. All of this contributes to making your day meaningful and memorable. You have chosen to witness your mutual promises of love and fidelity in the Catholic Church, and your faith is an important determining factor in how you will enter into this intimate relationship of marriage. The Church is responsible for discerning your intentions and capacities for making this promise, and is required to assemble various documents. Baptismal Certificates newly issued and dated within six months of the date you are to be married. Catholics should contact their church of baptism and inform them of your date of marriage, and the address of St. Francis of Assisi (Attention: Sacramental Records -15050 S. Wolf Rd. – Orland Park, IL 60467) where they are to send the certificate. Photocopies of originals cannot be accepted. Non-Catholic Christians need to supply a record of baptism. For Catholics, newly issued and dated within six months of the date you are to be married. Please note that records are often kept at the church of Baptism, so one certificate frequently has both baptism and confirmation dates on it. Witness Affidavits testifying to your freedom to marry are required from both the bride and groom. We will give you a form and ask that parents or close family member complete them. Permission for Marriage of a Mixed-Religion, which will either be approved by the pastor or associate pastor if one of the couple is a baptized Christian, or by the bishop if one of the couple is a non-Christian. Dispensation from Canonical Form granted by the bishop if the Catholic will celebrate the wedding in the tradition of the non-Catholic spouse. You may contact either St. Michaels (in Orland Park) or St. Julie (in Tinley Park) to participate in a program locally. Engaged couples can attend a one day PreCana class held on a Saturday led by a trained married couple at a variety of parishes. Some of the topics presented are: the sacrament of marriage, couple prayer, family of origin, couple adjustment and growth, Catholic faith, natural family planning, conflict management, finances and children. The fee for PreCana is $195.00 per couple. You may register online at pvm.archchicago.org or call 312-534-8351. Click to see dates and locations. Information regarding the program is available online at www.familyministries.org. After the Mass/ceremony, the officiating priest will sign your Marriage License and mail it to the Cook County Clerk. Marriage is a Sacrament. It is not a social or private event. It is part of the Church’s worship life. In the presence of the entire congregation you commit yourselves to one another. When the couple meets with the priest, they will determine whether their marriage will be celebrated as a Nuptial Mass (with Communion) or a Marriage Ceremony (without Communion). Please consider both families and guests when making this decision. All are welcome at St. Francis of Assisi. Everyone present should be encouraged to participate. If this is an interfaith marriage, or if the majority of your guests are not Catholic (and so will not participate in the Eucharist), you may want to consider a Marriage Ceremony (without Communion). You will be asked to select two readings for your ceremony as well as prepare the Universal Prayer. You may choose to light a Unity Candle. This is a symbol of unity, but not an official part of the Church’s liturgical ritual. The wedding vows, rings and your verbal commitments to promise love and fidelity are also signs of unity and so the lighting of the candle is not necessary. If you have a devotion to the Blessed Mother, you may choose to bring flowers to the Blessed Virgin Mary as part of your ceremony. Please discuss this with the Priest. Family members or friends who are Catholic Priests or Deacons are welcome to celebrate the Marriage. This arrangement must be set up with one of the St. Francis priests. A reminder that any priest/deacon not of the Archdiocese of Chicago, while welcome, must have a letter of suitability issued by his diocese and sent to Fr. Jerry Boland, (312) 534-8212. Ministers or priests of other faith traditions are welcome to attend and help celebrate interfaith marriages. The St. Francis priest will discuss these arrangements with the couple. Because of national Church regulations, this needs to be done three months in advance. Changes to the St. Francis norms must be cleared in advance with one of the St. Francis priests. At the time the couple meets with a parish priest to reserve their date, couples are given information on our parish Wedding Workshops. All music selected for the liturgy must be of a sacred rather than secular nature. Music must be scripturally sound and reflective of the public and communal nature of the celebration. You will be supplied with a comprehensive list of appropriate selections, as well as a demo CD, at the Wedding Workshop. The music tracks are available online by clicking here. If a couple wishes additional instrumentation (besides organ and/or piano) and/or musical groups, these can be arranged through the Director of Music. All cantors, soloists, string, woodwind or brass musicians and ensembles must first be approved by the Director of Music and must be familiar with the Catholic liturgy and abide by the standards of music selection mentioned above. All issues regarding music personnel, qualifications and their fees will be addressed at the Wedding Workshop. If you choose to light the Unity Candle, this takes place after the exchange of rings. The couple needs to provide the unity candle, 2 side tapers and holders. If you are printing a program booklet, a rough draft is to be approved by the Director of Music prior to printing so that it can be reviewed for proper order, etc. If you are considering small children as part of the wedding party, we suggest you ask children 4 years or older. It is our experience that younger children get frightened and often are unable to walk up the aisle. Wedding rehearsals are conducted by the St. Francis wedding coordinator. It is possible that there may be a number of rehearsals on a given evening. Out of courtesy to everyone, all should arrive 10 minutes before the scheduled time so the rehearsal can begin at the designated time. To make plans for rehearsal dinners, the rehearsal will run between 45 minutes to 1 hour. The St. Francis wedding coordinator will conduct your rehearsal based on the norms for weddings established at St. Francis. Any and all changes to these norms must first have the approval of the priest who will officiate at your wedding. The rehearsal is conducted for the bridal party and their families and is not intended for musicians or vocalists. Music rehearsals are arranged by the Music Ministry Office. Music fees (for additional musicians arranged through St. Francis). All music fees MUST be paid in advance. Many musicians must leave immediately following the ceremony. Therefore, all music fees must be paid prior to rendering of services. In keeping with the solemnity of the occasion, the consumption of alcoholic beverages in parish buildings or anywhere on the property is not appropriate. Alcohol should not be consumed prior to the rehearsal or the wedding. Smoking is not permitted within the parish buildings. The bride and her attendants are welcome to use the “Bride's Room." Please be advised, however, that the parish cannot be responsible for lost or stolen belongings. Food should not be brought in. Soft drinks and water are fine. Photographs may be taken following the ceremony. In deference to and in consideration of other marriages or church activities that follow each wedding, all weddings (including pictures) are limited to one hour and 30 minutes after the scheduled start of the wedding. The church is decorated according to the liturgical season. In general: Advent – dark violet, Christmas & Easter – white, Lent – purple, Pentecost weekend – red, Ordinary Time – green. While not a liturgical season, there may be yellows and oranges in the fall. These decorations are not to be removed or rearranged in any way. Tape or wire may not be used to affix decorations to the pews. Ordinarily, one spray is more appropriate than two traditional "altar" pieces (see floor plan). The florist (or the person in charge of decorations) is asked to remove any wedding decorations you wish saved, immediately following the ceremony. Prayer booklets/programs should also be removed if you wish them saved. The church will remove and dispose of remaining decorations. The release of balloons, the throwing of rice, birdseed, the dropping of flower petals or use of bubbles is not permitted inside or outside the church. Besides the obvious clean-up problems, these can create safety hazards and be injurious to the environment. Also, signs announcing the bride are not respectful of the Liturgy. ​Arrangements for a runner, if desired, should be made with your florist. The runner should be 60 feet in length. The florist will be responsible for securing the runner. Runners are not recommended. The photographer and/or videographer are to meet with the St. Francis wedding coordinator on the day of the wedding prior to the setting up and/or taking of pictures. The following guidelines should be observed. Photographers/Videographers are not allowed in the sanctuary area. 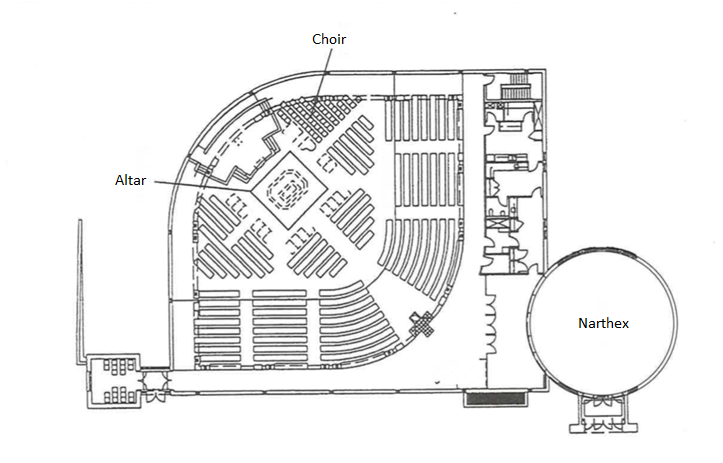 Please refer to church layout provided. Videographers may not set up any equipment in front of the music area. The procession or any part of the Liturgy is not to be interrupted by pictures or videos. Church furnishings or decorations are not to be moved. Tape and wire are not allowed on wood surfaces. Please be sure to have all your equipment before leaving the church. We regret we cannot be responsible for any equipment left behind. In deference to and in consideration of other marriages or church activities that follow each wedding, all bridal parties are requested to leave the premises one hour and thirty minutes after the scheduled start of the wedding.